Why and how does complexity usually tend to increase through time? The question of complexity is classic in the very first lectures of evolutionary biology where the teacher usually tries to tell the students that complexity does not necessarily increase and that humans are not more complex than other organisms. Why does complexity tend to increase through evolutionary time? What are the different hypotheses to explain this pattern? Mean complexity among all living things? Complexity of the most complex taxon? I suppose that anyone who wishes to answer to this post will necessarily need to define the words "complexity". He or she might define it in terms of number of genes, number of metabolic pathways, length of DNA sequence, number of cell types, some kind of index taken from information theory. When asking my questions I had in mind a definition close to "number of genes" or "number of metabolic pathways". Complexity in Biology What I can say is that these kinds of questions have started an almost new field in Biology, called "diversity evolution", here is a very interesting paper: Diversity Evolution. Defining Complexity You were right to mention Complexity first needs to be defined, and as an early field of science this is where much focus has been recently. There are quite a few definitions but it is perhaps too controversial to list any particulars... HERE is a whole UCL lecture dedicated to defining Complexity! I think there is a way to tackle the issue however it requires a lot of work on the "edges" of what we consider science and philosophy (and their interaction with each other). I can propose you a suggestion but it is my own research, so it can be quite controversial and please, bare with me. First the big question here-what is complexity can have multiple answers upon the definition you use. But definitions aren't the subject of biology but of philosophy. And in philosophy whole fields of study can simply dissolve if their definitions prove unsatisfactory. So, one can argue there isn't anything like complexity in Nature and every single time this word is used we can find some problem defined in the terms of some science where the word complexity is missing. One can argue if we can do this for all cases the word complexity is used, then, there truly isn't such a thing like complexity in Nature, but rather it is an artificial human language construct and as such has no objective base in reality. I refer to such cases as "denial by definition". Pay attention that even the very word "Life" itself can be the subject of "denial by definition" and if it is indeed denied, then how about the rest of biology? So, the "denial by definition" can be serious issue for many problems in biology, not just complexity. In order to avoid it the only way to proceed would be to find one or more universal characteristics behind what we can call complexity having common origins. It is the origins which are important because they can provide us with a common mechanism behind the process and thus give us a way to put "flesh" on the word complexity by denoting the same effect under different circumstances. If you can make such a dictionary definition of complexity than you can relate it directly to the mechanism creating such effects and show its use is more than a convenient semantic coincidence but there are some real scientific implications for your question. Now, such an effect should have its defining cases-these circumstances when what you are trying to show exists as more than just a convenient word and emerges as a real world characteristic of the system. Then the problem is transferred from one of philosophy to one of science and you can have your definition of complexity. Then, complexity is equated to what characteristics emerge in the system with the advent of new processes taking place in it. 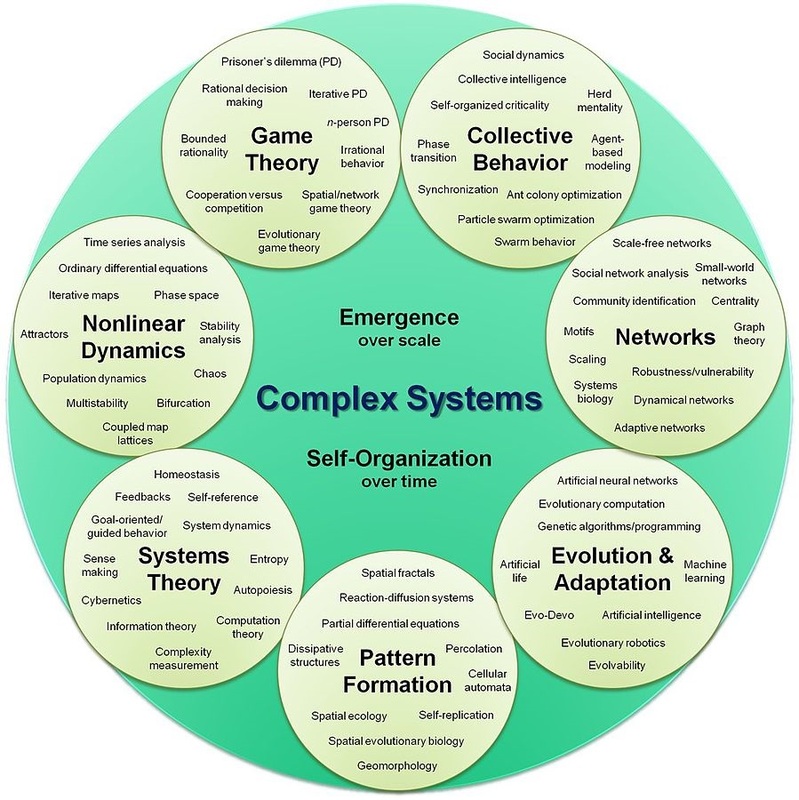 I believe such a solution to the problem of the definition of complexity provides best use for science because it turns the problem of defining complexity into the problem of the emergence of properties when new mechanisms appear in the system. I know may be the philosophy is too much for you but can you understand me? If we follow through these assumptions then complexity arises in the system only when we can show direct link between the emergence of new characteristics of the systems (things that can describe it) and new processes in it. Then we can conditionally define "simplicity" as the state when both the characteristics of the system and its organization are unchanged, some "unrelated states" when the system can accumulate new characteristics or organization without one changing the other and complexity only when change in the characteristics relates to change in the organization and vice versa. I know this definition may sound quite "obscure" for biology because it doesn't specifically prescribe genes, or proteins or metabolic pathways or anything for that matter but, please, consider some examples. If a new metabolic pathway arises do the number of genes remain the same? What about their organization? What about the way their organization is itself organized? However, if an animal adapts for a new environment does it always implies some "fundamental" changes in its anatomy and physiology or does the simple change of "minor details" suffice to make it fit for its new niche? In the first case you can say there is a remarkable increase in complexity, while in the second you can claim just "a simple adaptation". In order to connect the increase in adaptive variation and the organization generating it one needs to know the mechanism beyond both, which as you can see returns us back to the point already discussed in the "denial by definition" problem. If there is an increase in the number and/or interconnectedness of such mechanisms one can make the point the two are pretty much connected with each other and prove the point such a definition can be taken as the definition of complexity in biology. Then, the "denial by definition" argument automatically dissolves by itself and such a definition of complexity can be accepted as a working one. On the other hand if there isn't any relationship between the generation of new mechanisms in the living world and an increase in the connection between variation and organization we should be able to see examples of increased variation without new organizational features and the vice versa. However, I think we can easily prove that in the living world in order to increase the potential variation any lifeform can have, the number of its organizational features should also increase and the vice versa. Can you imagine spiders evolving into diverse families and species without their ability to weave webs? Or the evolution of the higher plants without the evolution of leaves? Or the evolution of new bacteria without the evolution of new metabolic pathways? And so on and on. I believe you can readily see the point that every time adaptive variation becomes able to widen its scope one can see the corresponding emergence of new organizational features. I believe you can easily make the case for the opposite argument, too-that new organizational features always increase the ability of the organism to vary and therefore to take over new niches. I wouldn't be giving examples for the sake of shortness here but I believe you can see my point. New organizations widens variation and new variation allows better adaptability. Of course, new organization isn't always required by the organism to adapt to new niches, but new organization always arises and stays in evolution to make the organism fit for new niches. My argument is that this relation is the mechanism connecting adaptive variation and the increase in the number of organizational features and it by itself is the definition of complexity one should adopt in biology. Thus, complexity can be defined as the increase in organization driving the increase in the potential (here potential is key word because one can make the case new organisms with new organizational features can have lesser ability to vary than their ancestors, and in fact we can see that there is the trend the more "complex" the organism is the more are those features which remain conservative through its further evolution, but if we consider the overall ability of the new organism to evolve ever newer and newer forms we can see more complexity actually generates more variation because the ability of the ancestor to vary was limited by its organizational features while the evolution of newer features means they can add more possible routes evolution can use-"the trick" isn't to consider the overall ability of the ancestor to evolve on many potential routes but the net gain available to vary more organizational features give on the routes of its descendants which has to be greater than the ancestor according to this definition) variation which can be used to adapt to new niches. If I have to "translate" it in a more "layman" (e.g. non-philosopher) terms complexity is the increase of possible routes evolution can take on when new organizational features emerge. It means the emergence of new organization have to always generate more variation which can be used to adapt to new niches and the ability of the organism to widen its adaptability must always come with the emergence of new organizational features. If we adopt this definition then organization and adaptation become fundamentally linked by definition and we don't have to search for the cause of either any more. The significance of this definition is that then this isn't mere "play of words" to define complexity any more, this is viable scientific hypothesis! We can prove the statement: " Every time new organizational feature appears more variation increasing the ability of an organism to adapt is also generated and the vice versa." by observation of our data. If you can provide even a single example of an organizational feature appearing "just by accident" with no extra ability to vary generated by it, then, you have your proof the above statement is wrong! One can argue philosophy is mere "play of words" where you can choose different conflicting "opinions" about a certain question and make the case they can be both correct depending on your point of view, but science isn't. It means the moment you can make a statement that can be put to the test by observations of reality this isn't philosophy any more-it's science! Do you understand my point? If this definition of complexity allows us to make statements about the observable universe, then, this isn't any more some "philosophical definition", it is verifiable scientific hypothesis which can be put to the test. It means we were able to "export" a question out of philosophy and "import" it into science. And this is an achievement! Then, this definition can serve as the base for viable scientific investigation. Now, the questions is "Why and how complexity usually tends to increase through time? ", right? (This is the last revision I'm using here-I don't remember exactly what was the previous one but I'm certain the topic is still about the reason (why) and the mechanism (how) complexity is increasing through time. Correct me if I'm wrong, please.) Therefore, our investigation requires what we deem as complexity to be able to increase through time for a reason (the "why" part) and with some common mechanism (the "how" part). Do you agree? The definition I already made the case for connects the increase in complexity (as the appearance of new organizational features) with the variability of the organism which in turn serves as the source of adaptability. Therefore, the reason why new organizational features should appear in the organism (and therefore, define this as an increase in complexity) is its adaptability. If the above hypothesis that the appearance of new organizational features and the generation of new variability for new adaptability holds (which is how we defined complexity), then, the reason for the appearance of more complexity (by definition) is the very environment the organism needs to adapt to. The reason fro complexity is none other than the reason for evolution itself-the drive to always increase its number. But in the particular case for complexity it is the fact that the environments presents to the organization of the organism new challenges its current form isn't able to adapt to. This is why the organism evolves some extra organizational features it can use to cope with these challenges. Now, I know may be this isn't the answer you were looking for when you specify about the genes or the proteins or whatever, but it is a viable answer of the question you posted. The term "new organizational feature" can represent wide range of possibilities-may be a new gene, may be new metabolic pathway, may be some new mechanism for the regulation of gene expression, may be the development of some new organ or gland in the organism, may be the development of new hormone and so on. As you can see the list is endless but this is exactly what the answer of your question is. Different environments force organisms to develop different organizational features which we deem as an increase in complexity. It is us who think of complexity as some "global move" of Life to more and more organization, but are you sure that Life itself thinks the same way (we if assume that evolution is intelligent)? Put yourself in the shoes of the evolving organism. Why do you need to evolve? Because you "feel like" you have to become more "organized" or because you simply must in order to survive the new environment? What do you think evolution would answer you if it could speak? It is us who think complexity is some "grand move" of Life to become more and more organized! From the point of view of the organism themselves Life is just Life as "usual". They simply want to survive and reproduce any way possible. Some of those ways involve "minor changes" well within the organizational features of the organisms themselves under their current level of organization, but some require what we (not the organisms themselves) can call as "giant leaps" or "quantum jumps" in evolution. Do you think the first fish to start to evolve into a land based animal wanted to walk? Or it simply wanted to be able to move on the ground to be able to escape drying ponds? What about the first reptile to be able to evolve into birds? Do you think it wanted to fly or to escape predators in the air? How about the first ape to become human? What did it want-to become an intelligent being able to change the world or to be able to gather into more compact and well organized groups to find food and fend off predators better? I think the examples are endless here, too. The point is the environment itself sometimes requires organisms to get new organizational features to survive in it, not that there is some "grand mechanism" or "tendency" of Life to get more "organized". If such "great tendency" is to be assigned then it has to be to the environment itself, not to the organisms! One can make the case the more organisms an ecosystems has and the more are their interactions among themselves the more new niches this ecosystems can offer to new organisms which in turn can develop new organizational features which can produce new organisms which can offer yet other new organisms more new niches and so on in an ever expanding self-sustaining process. Here is a nice reason for complexity, isn't it? The argument can be further extended for organization itself. If new organization (which is required by the diversifying environment) can bring about more diverse environment which can in turn bring about the emergence of niches requiring even more organized organisms and so on in a self-sustaining manner, then, in a way the mechanism to bring about ever more complexity in the world. But, remember, this is not depending on the organism itself, but on its environment. The question of "Why does complexity usually tends to increase through time?" is transformed into the question "Does the ecosystem itself require increase in complexity to develop further?" which as you can see are 2 very different questions. Then the focus fall not on complexity by definition but on the environment as a whole. And this is one very different question. And it is one we can have the answer to if we can know enough about the ecosystem this organism is in. Once again you can see how "superficially" "philosophical" questions can be transformed into distinctly different scientific questions if we can clarify our definitions and follow through the consequences of those. This is a particular approach I myself have developed but it isn't something accepted by the community, so you are free to disagree with my approach and answer. As far as the mechanism part of your question is concerned I already "touched" on it when I defined complexity.By the very definition I expounded whenever there is an increase in complexity (e.g. the appearance of novel organizational features) there is an increase in adaptability it brings on. Therefore, the more complexity an organism accumulates the better it can adapt to particular conditions. The increase in adaptation means novel features it has and the novel features it has define complexity, therefore, one can argue adaptation driven by the accumulation of novel organizational features IS the mechanism of complexity increase. This is a "classical" case of the "denial by definition" argument I put on previously! If you say complexity increase is the adaptation by accumulation of organizational features, then the entire question "What is the mechanism of complexity increase?" which in turn can be equated to your question "How does complexity usually tend to increase through time?" simply dissolves or to put it in layman's terms-makes no sense at all. I know it may seem like "too much philosophy" for biology but the thing is the arguments I put forward actually make sense if taken together and if you want to come to a satisfactory answer to your question (which itself isn't asked in a clear-minded manner according to me), then you need to take the steps I already described and "translate" it into questions which can be answered in more rigorous manner and if they are done (as I suggest here) may be you can agree you have your answer? To conclude this all too long reply I would like to reflect on personal experience with both philosophers and biologists. My experience has been that both the philosophers don't want to reflect on the science biologists are trying to put on with their questions and the biologists don't want to reflect on the arguments philosophers are trying to put on when reflecting on the biological questions. In my mind this is what "the tragedy" of modern biology is part of because philosophy may be is able to provide answers biologists may find useful but they just aren't listening to them. On the other hand if biologist can "export" difficult to tackle in the modern biological paradigm questions to philosophy, than, may be, philosophers can bring on understanding and possible explanations biologists are just missing! It can be very fruitful relationship! But in order to do it one just has to listen to what the other has to say and this "listening" isn't something either side do very well in my mind. Thank you very much if you managed to endure long enough to get to here, I didn't intended to make this answer so long but as you can see the argument isn't easy to follow either. The phenomenon of increasing complexity is natural puzzle for everybody studying biology, because "nothing in biology makes sense". Stuart Kauffman shifted the emphasis from complexity to order, and this is IMO the right observation: chaotic systems are more complex in thermodynamic sense, while biological systems occupy a thin niche on the border of chaos. There are many ideas in this book but, unlike the famous manuscript which title Stuart has apparently followed after, there is no satisfactory and compelling answer to that question yet. Biology arises when some molecules begin copying themselves with a certain amount of error: not too much error, or there would be no heritability; but SOME error, or else there would be no evolution at all. Copying, copying, a few molecules become a multitude, and evolution spreads in all directions, to the more and to the less complex. But when a new level of complexity arises, it usually allows a new size, and a bigger organism can, for instance, eat a smaller organism. Once this level is achieved, it tends to be mantained. Again some copies will lead to smaller lineages, but the big ones have founded a niche that will not disappear by itself (it may take an asteroid). So, looking up close, evolution leads to diversity, not only to higher complexity. But since small complexity already existed, and bigger complexity is something new, we tend to perceive evolution as creating complexity - which is not a false point of view. Not the answer you're looking for? Browse other questions tagged evolution genetics theoretical-biology molecular-evolution information-theory or ask your own question. What is the relationship between complexity and organization in biology? Why does the apex of the human heart usually point to the left? Why does human facial and head hair continue to grow? What exactly is extreme heterozygosity and how does it work? How can the number of genes increase through evolution? Is natural selection a tautology, and therefore not truly falsifiable? How much time does it take for an evolutionary change to take place?